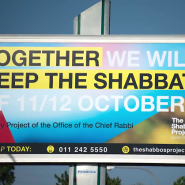 This video is a sweet taste of Messianic times…A moving documentary about the time the majority of South African Jews of all types came together to keep one Shabbos. I can’t wait to see this in Israel!!! Tissue-alert. Thank you SO MUCH for posting this video today! I am grateful to know about The Shabbos Project and to participate this year. Thank you for posting this. What an incredible event. I cried watching, not silent tears but those tears that come from your belly and take your breath away. It touched my Neshama on such a deep level. Thank you. Beautiful!! Maybe I’ll forward this to someone here in Seattle and we can do it here! I can’t believe that I had not heard about it. Thanks for sharing this. Let us spread the word to the world. Beyond Tissues…Goosebumps! Goosebumps! It’s because, like Malka said, we feel it’s profundity soul-deep, and so – clearly- did everyone who participated there!